Vintage Clothing Finds. Top Designers. 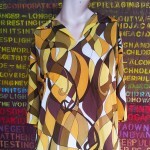 Light fabric and flattering style with small collar, 3/4 length sleeves and side splits at bottom. Created from, very comfortable, non cling, super soft fabric. 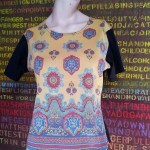 Paisley design on front with black short sleeves and a black back. Made from 100% Polyester in yellow, red and aqua. Wrinkle free! 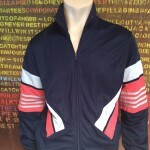 Early 1990’s vintage original Adidas tracksuit Jacket. Zip up jacket with 2 side slit pockets. Made from Tri- acetate polyester fabric with a navy blue background, red and light grey stripes over chest and top arm area. 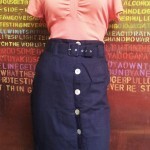 An original 1980’s high waist pencil skirt. Made by designer WARWICK JONES . Created from navy metal blue, cotton ramie fabric. Comes with a matching belt but would look super with a wider belt. The style shapes to the body with opening at the front, buttoning up with mother of pearl buttons down the front. Super cute vintage “Sarraiel Parasol” sleeveless top for summer days. Light and flattering . Made from 100% Polyester in black and white checks. 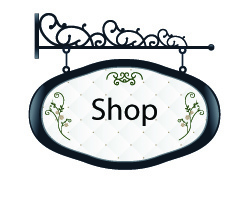 This entry was posted in vintage clothing, vintage designer clothing, vintage shop on December 30, 2015 by admin.